Leaders from regions of the Russian Federation and top domestic technology companies were part of a business mission that visited Japan on 4–5 February 2019. Russian experts held presentations in Tokyo about the investment potential of Russia’s regions, informed their Japanese partners about distinctive features of the Russian economy and the activities of Russian technology companies, and engaged in business negotiations. The event was organized by the Agency for Strategic Initiatives and the Roscongress Foundation in collaboration with the Japan External Trade Organization (JETRO). On the first day of the business mission, the Russians visited the Invest Japan Business Support Center and the Tokyo One-Stop Business Establishment Center. The heads of regional delegations took part in a business lunch on behalf of the Chairman of the Japan External Trade Organization (JETRO) Hiroyuki Ishige. Representatives of the Skolkovo Foundation, Copter Express Technologies, Heedbook Cloud, Skyeng, TalkBank, and other companies presented Russian technology projects at the event. Negotiations involving Russian and Japanese businessmen and government officials were held on the same day. “Russian-Japanese cooperation has been gaining more and more momentum in the international arena in recent years. Meetings of the heads of state are held regularly. High-level inter-parliamentary relations have intensified. The Russian-Japanese business community is also developing in a new manner. Japanese corporations are actively investing in various sectors of Russian industry and agriculture. The diversification of economic ties, their extension to knowledge-intensive and high-tech industries, and the development of scientific and technical cooperation will continue to contribute to such close cooperation between the businesses of the two countries”, Adviser to the Russian President Anton Kobyakov said. 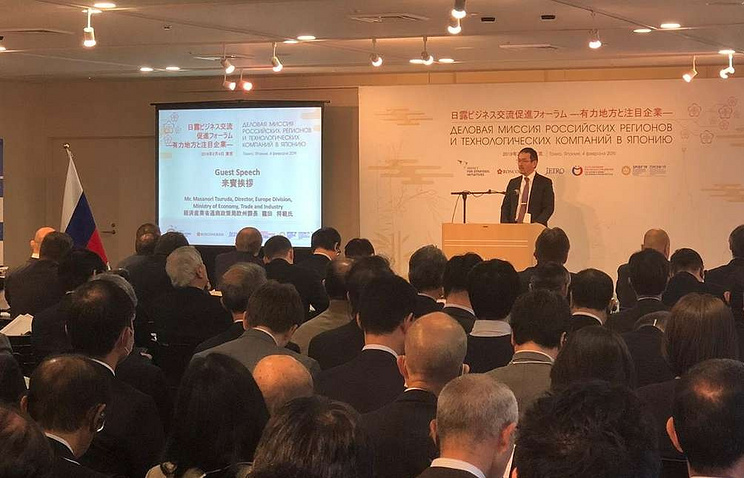 Agency for Strategic Initiatives Deputy Director General Alexander Pirozhenko gave a welcome address to the Russian and Japanese participants in a presentation of the investment potential of the Russian regions and technologies. “Japan is the Russian Federation’s tenth biggest partner in terms of trade turnover, and today there is enormous potential for developing joint business and expanding our economic and financial relations. The representatives of Japanese business and our companies that have come today to establish B2B contacts are interested in starting substantive negotiations and launching joint projects today”, he said. The event featured presentations by Chairman of the Japan External Trade Organization (JETRO) Hiroyuki Ishige, First Deputy Governor of the Sverdlovsk Region Alexey Orlov, Deputy Governor of the Kaluga Region Vladimir Popov, Deputy Governor of the Voronezh Region Vitaly Shabalatov, Deputy Governor of the Primorsky Territory Konstantin Bogdanenko, Deputy Prime Minister of the Khabarovsk Territory Government Yury Chaika, Deputy Prime Minister of the Krasnoyarsk Territory Government Sergey Vereshchagin, General Director of the Nizhny Novgorod Region Development Corporation Timur Khalitov, Minister of Industry and Trade of the Novgorod Region Ilya Malenko, and other experts. During the second day, the Russian delegates learned first-hand about a number of projects being implemented by technological companies of the host country. The members of the business mission took a trip to Kashiwa-no-ha Smart City, where they visited the business incubator, and also studied the operation of the smart energy distribution system used in the city. The delegation members were also shown a presentation on the latest waste recycling practices and given a tour of the Katsushika Incineration Plant in Tokyo. The final stop on their programme was a visit to Fujitsu’s netCommunity showroom, where they viewed a presentation of the latest developments in information and communication technologies: an artificial intelligence-based system for monitoring the urban environment, an integrated emergency warning system, and other projects. The business mission members offered high praise for the potential of partnerships with Japanese entrepreneurs. “Today, partnerships with our Japanese industrial partners Fanuc and Panasonic are developing productively, and joint research projects are being implemented with RIKEN and JUNTENDO. Thanks to our joint efforts, Russian start-ups have tremendous opportunities both to attract Japanese investment and to make advances in the Asian market”, Skolkovo Foundation Senior Vice President for Innovation Kirill Kai said. At present, about 1,900 companies are residents of Skolkovo. As of the end of 2018, the Foundation’s start-ups had revenue of more than USD 800 million and had raised investments of approximately USD 140 million. The project brings together more than 30,000 high-tech jobs. “Our region is connected with Japan through rapidly developing partnerships. In 2018, trade turnover between our enterprises grew by 7% and surpassed USD 150 million”, First Deputy Governor of the Sverdlovsk Region Alexey Orlov said. The business mission to Tokyo will facilitate the development of trade and economic relations between Russia and Japan as well as expand the pool of joint Russian-Japanese investment and technology projects. The mission was part of the programme for the Year of Russia in Japan. The dialogue between Russian and Japanese companies will continue at the St. Petersburg International Economic Forum and the Eastern Economic Forum.